234 Beacon is located on the NE corner of Beacon and Dartmouth, with 232 Beacon to the east, 236-238 Beacon to the west, across Dartmouth, and 255 Beacon to the south, across Beacon. 234 Beacon was built ca. 1863, one of a symmetrical pair (232-234 Beacon), as the home of George Bigelow Chase and his wife, Anne Bard (Lowndes) Chase, on land which he purchased on March 5, 1862, from the Boston and Roxbury Mill Corporation. Click here for an index to the deeds for 234 Beacon. George Chase was a ship owner and shipping merchant until 1868. From 1868 to 1876, he was director and transfer agent of the Rutland Railroad. He remained active in railroad and other business matters. 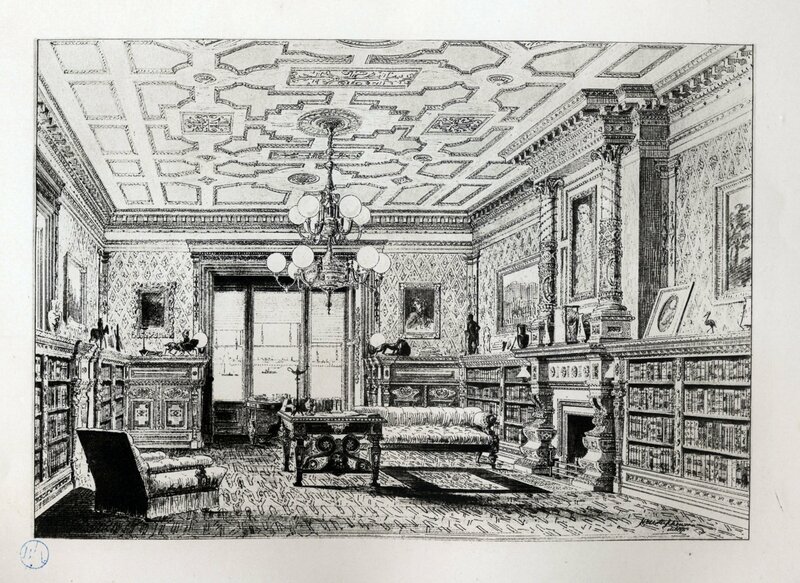 The library at 234 Beacon is illustrated and described in The Book of American Interiors, by Charles Wyllys Elliott, published in 1876. In the description, the room is said to be 33 feet long and 23 feet wide, with an exceptional mantel-piece and an elaborately decorated ceiling divided into panels in the “Elizabethan” style. 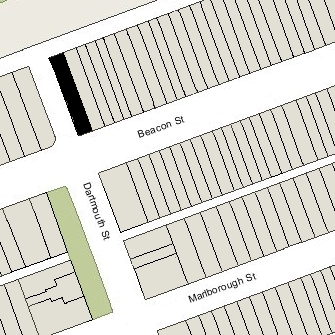 On February 7, 1883, George Chase acquired 232 Beacon next door, which he leased to others. The Chases continued to live at 234 Beacon during the 1891-1892 winter season, when he retired from business and they went to Europe for four years. On November 8, 1892, he executed a power of attorney leaving his affairs in the hands of his son-in-law, Harcourt Amory, a textile manufacturer (Harcourt Amory had married in April of 1891 to Gertrude Lowndes Chase; they lived at 251 Beacon). At the time he executed the power of attorney, George Chase was living in Marlborough, New Hampshire; when the Chases returned from Europe, they lived in Dedham. During the 1892-1893 winter season, 234 Beacon was the home of Charles Arthur Sinclair and his wife, Emma Isabelle (Jones) Sinclair. Their primary residence was in Portsmouth, New Hampshire, where he was a partner in his father-in-law’s brewery and a member of the State Senate. He also was a major investor in railroads and in button and shoe manufacturing, and was owner of the Portsmouth Daily Times and the Quincy House hotel in Boston. On August 8, 1893, George Chase (through Harcourt Amory) transferred 232 Beacon and 234 Beacon along with other property to attorney Charles Sedgwick Rackemann as trustee. It appears that the transfer was in contemplation of impending financial difficulties, inasmuch as it authorized Charles Rackemann to dispose of the property for the benefit of George Chases’ creditors ”with only such preferences as are provided by the insolvency laws…”. During the 1893-1894 winter season, 234 Beacon was the home of architect Arthur Rotch and his wife, Lisette de Wolf (Colt) Rotch. They had lived at 82 Commonwealth in 1893. Arthur Rotch died in August of 1894. During the 1894-1895 winter season, 234 Beacon was the home of Anna Smith (Miller) Bigelow, the widow of Massachusetts Chief Justice George Tyler Bigelow, and their daughter, Caroline Miller (Bigelow) Amory, the wife of George Washington Amory (who was living separately at 10 Charles). In 1893, Mrs. Bigelow had lived at 351 Beacon. Anna Bigelow’s husband was the maternal uncle of George Bigelow Chase, and George Washington Amory was the first cousin of Harcourt Amory. By the 1895-1896 season, Mrs. Bigelow and Mrs. Amory had moved to 8 Gloucester. 234 Beacon was not listed in the 1896 Blue Book. During the 1896-1897 winter season, 234 Beacon was the home of Katharine (Lowell) Roosevelt, the widow of Alfred Roosevelt. He had been a banker in New York City and was killed in a railroad accident in July of 1891. She had lived at 167 Commonwealth during the previous season. In early 1897, she purchased and subsequently moved to 282 Beacon. On June 10, 1897, 234 Beacon was purchased from Charles S. Rackemann, trustee, by attorney and real estate dealer Andrew Cunningham Wheelwright. He and his wife, Sarah (Cabot) Wheelwright lived at 73 Mt. Vernon. He leased 234 Beacon to others. 234 Beacon was not listed in the 1898 Blue Book. By the 1898-1899 winter season, it was the home of Moses Williams and his wife, Martha C. (Fininley) Williams. They also maintained a home in Brookline. Moses Williams was an attorney and president of the State Street Trust Company. They continued to live at 234 Beacon in 1902. By 1903, they had moved to their home in Brookline. Their unmarried sons, Moses Williams, Jr., a lawyer, and Hugh Williams, a physician, moved to 267 Beacon. 234 Beacon was not listed in the 1903-1905 Blue Books. On February 28, 1905, 234 Beacon was purchased from Andrew Wheelwright by real estate dealer Henry Bigelow Williams, and on March 8, 1905, it was purchased from him by Mary Adams (Leonard) Stone, the wife of Charles Augustus Stone. They previously had lived at 349 Commonwealth. Charles Stone and his MIT classmate, Edwin Webster, founded the firm of Stone & Webster in 1889. Under their leadership, it became a major international construction, engineering, and consulting firm. In December of 1912, Mary Stone filed for permission to construct a 13-foot by 17-foot sunroom on the roof of 234 Beacon. The permit was denied by the Building Department on the grounds that it would constitute a sixth story. Mrs. Stone appealed the decision and the denial was reversed by the Board of Appeal in January of 1913. The Stones continued to live at 234 Beacon in 1916. They also maintained a home in Plymouth. By 1917, they had moved to New York City. They continued to own 234 Beacon and lease it to others. By the 1916-1917 winter season, 234 Beacon was the home of Edward Pierson Beebe and Franklin Huntington Beebe, unmarried brothers. They previously had lived at 30 Beacon. They also maintained a home, Highfield Hall, in Falmouth. The Beebes were sons of dry goods merchant James Madison Beebe. They continued to live at 234 Beacon during the 1919-1920 winter season, but moved thereafter to 71 Beacon. By the 1920-1921 winter season, 234 Beacon was the home of contractor William Samuel Patten and his wife, Anna Morton (Thayer) Patten. They continued to live there in 1925, but had moved to 294 Beacon by 1926. On July 19, 1927, 234 Beacon was acquired from Mary Stone by the School of Fine Arts and Crafts. It previously had been located at 349 Newbury, which had been severely damaged by fire on April 21, 1927. In July of 1927, the school filed for (and subsequently received) permission to convert the house from a single-family dwelling into a school. Plans for the remodeling, drawn by carpenter-builder James Wood, are included in the City of Boston Blueprints Collection in the Boston Public Library’s Arts Department (reference BIN P-49). The school remained there until about 1939. From about 1931, it was called the School of Fine Arts, and from about 1937 it had become the Child Walker School of Design. On April 18, 1939, the State Street Trust Company foreclosed on the mortgage it held from the School of Fine Arts and Crafts and took possession of the property. On November 8, 1939, 234 Beacon was acquired from the State Street Trust Company by real estate dealer Ray C. Johnson, probably acquired on behalf of attorney and real estate investor Maurice Eli Goldberg. 234 Beacon was shown as vacant in the 1940 City Directory. In May of 1940, James F. O’Brien of Maurice Goldberg’s office applied for (and subsequently received) permission to convert the property into twelve apartments. As part of the remodeling, designed by architect Herman L. Feer, the front entrance was lowered to street level, the front façade was “modernized” to eliminate much of the original architectural detail, and the mansard roof was removed and the fifth floor rebuilt. The application also proposed to remove the rear ell. Plans for the remodeling – including elevations and floor plans – are included in the City of Boston Blueprints Collection in the Boston Public Library’s Arts Department (reference BIN R-25). On October 15, 1940, 234 Beacon was acquired from Ray C. Johnson by Maurice Goldberg’s son, Richard H. Goldberg. In July of 1941, a building inspector noted that the rear ell was being remodeled (not removed, as had been approved), and a violation was subsequently issued. In August of 1941, Ray Johnson amended the previous application, seeking (and subsequently receiving) permission to remodel the storage building into a three-car garage. On May 16, 1942, Richard Goldberg transferred 234 Beacon to William A. Sargent, and on March 12, 1948, William Sargent transferred the property to Walter S. Gainey. On March 9, 1959, Walter Gainey transferred 234 Beacon to Maurice E. Goldberg as trustee of the Maurice E. Goldberg Charitable and Educational Trust. 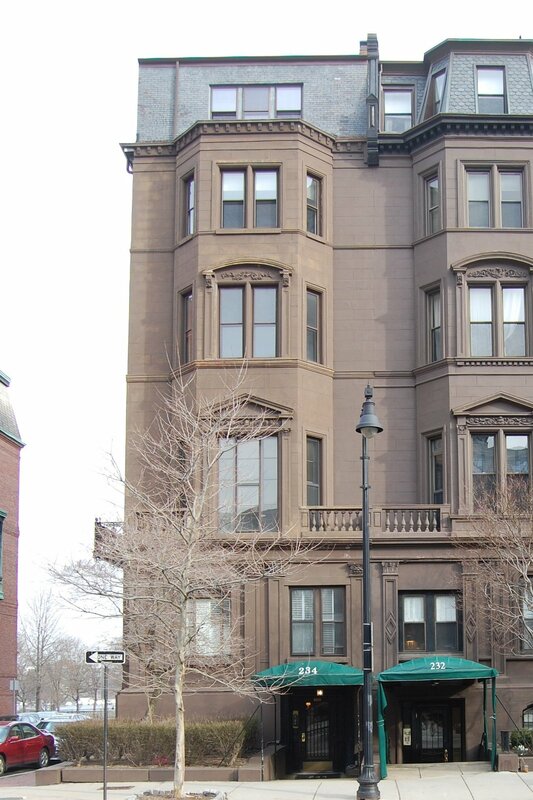 On November 7, 1968, the trust entered into an agreement with Snelling Robinson Brainard and David V. Harkins, trustees of the Beacon Street Improvement Trust, granting them an option to purchase 234 Beacon on or before December 27, 1969. That same month, the Beacon Street Improvement Trust acquired 228-230-232 Beacon, and in April of 1969 it obtained an option to purchase 226 Beacon. On June 19, 1969, Maurice Goldberg extended the deadline for the option on 234 Beacon to February 1, 1970. In November of 1969, the Beacon Street Improvement Trust filed for permission to tear down 222-224-226-228-230-232-234 Beacon and replace them with a 32-story, steel framed and brick clad tower at the northeast corner of Beacon and Dartmouth. The building would have had 96 units and a 100 car garage. A companion, 36-story building was proposed at the same time on the northwest corner of Beacon and Dartmouth, replacing 236-238-240-242-244-246 Beacon. The proposed twin-tower project met with strong opposition by residents and was abandoned after the City established height limits on all buildings in the residential portion of the Back Bay. 234 Beacon remained the property of the Maurice E. Goldberg Charitable and Educational Trust — one of a number of holdings — until after Maurice Goldberg’s death in July of 1972. On July 22, 1976. the trust sold 234 Beacon to his daughter, Barbara Grace (Goldberg) Weingarden (of St. Louis Park, Minnesota). At the same, it also sold her 29 Fairfield, and sold her brother, Richard H. Goldberg, 113 Commonwealth, 207 Commonwealth and 246 Commonwealth. On June 7, 1978, 234 Beacon was purchased from Barbara Weingarden by Andrew B. Rose and Gerald Gouchberg, trustees of the Northern Rose Realty Trust. That same month, Northern Rose Realty Trust applied for (and subsequently received) permission to remodel the building and to confirm its legal occupancy as nine units. It may have been at this time that much of the “modernization” of the façade from the early 1940s had been reversed, with the cornice, string courses, and other details restored. 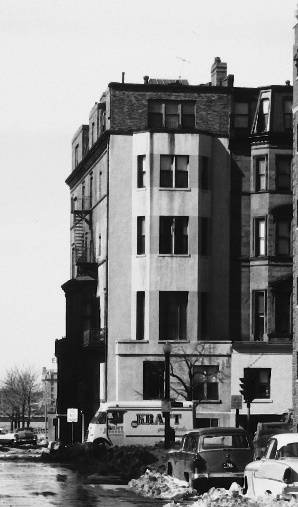 On June 30, 1978, the trust converted the property into nine condominium units, the 234 Beacon Street Condominium.